18/04/2019: A lively and modern curry house - and light years away from the old school flock wallpaper . 18/04/2019: Just had a team night out here tonight. Service was great especially from Ainsley. 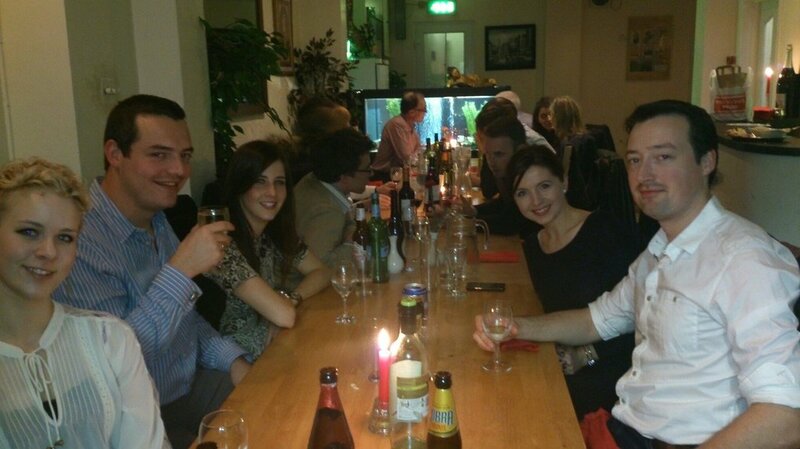 Our food was superb and everyone had a superb evening! 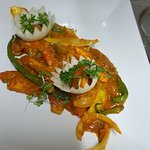 15/04/2019: Menu was different to the usual but food was delicious. We went on a Friday night, wasn't sure if we would get in as we hadn't booked. Luckily we got.tabke but it was very busy. Would definitely go back next time we are in Belfast. 15/04/2019: Went here for our anniversary and had a great time super clean and friendly always have a look at the loos for a bench mark "spotless" food is first class and portion sizes are perfect (if you hate the feeling of leaving a place sick cause your so full). We had starter, main and desert and espressos for about £70 for two of us so really well priced. Dont miss this place even if you only go once give it ago. 14/04/2019: Mi familia me llevó aquí para el Día de la Madre, así que en total éramos 5. Nos dieron nuestra mesa de inmediato y el hombre que nos servía sacó a todas las damas y a mi nieta de una rosa roja. Mi nieta estaba encantada. 05/04/2019: It's Friday night, I've been inflating footballs with Peter and Jacob, and I become famished. 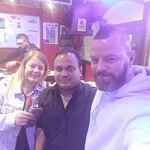 01/03/2019: Great food, atmosphere and service! 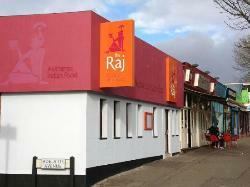 Best Indian food in Belfast. And fairly-priced. I recommend to all natives and tourists. 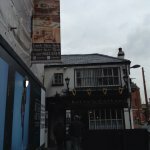 14/04/2019: Mi amigo y yo somos de Nueva York, por lo que estamos acostumbrados a la buena comida de todo el mundo, pero esta pequeña joya de Belfast nos impresionó. Increíble servicio, deliciosa comida y una excelente oferta de lunes a jueves. También BYOB así que golpea el viñedo en el siguiente bloque y disfruta! 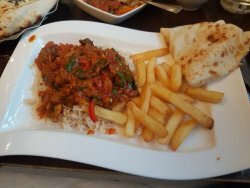 22/03/2019: Visiting Belfast for weekend, we had a wander down Ormeau Road looking for somewhere to eat the following evening. 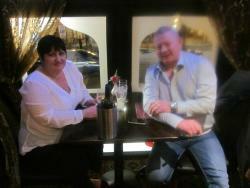 We had a look at menu outside which was good and main courses on average £8/9 we popped in and booked a table. On arrival the following evening the restaurant was very busy downstairs and we were shown to a table upstairs... have to say it was very cramped and felt there were too many tables in such a small area. The serving staff had to stand to one side to let each other pass. Menu’s were brought and I was extremely surprised to discover the prices on menu were on average £12/15 for main course approx 50 per cent more than advertised!!! 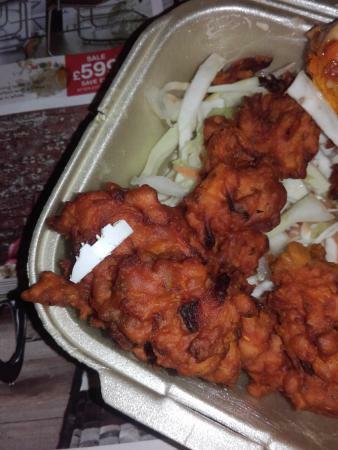 I have to say the food was lovely... no complaints there... unfortunately I could not eat all of my curry and rice and requested a “doggy bag” again I was taken by surprise when I was handed a plastic container and a brown bag!!! DIY doggy bag!!! 06/04/2019: Comida muy normal, cada curso de pollo sabía lo mismo! La compilación de música fue un conjunto muy rápido de canciones sin terminar que te hicieron apresurar la comida, haciendo que el ambiente fuera menos relajado y atractivo. 16/04/2019: Ate here with my husband & the food was fantastic. Excellent service too. Madras did was especially nice - spicy & delicious. Would highly recommend! 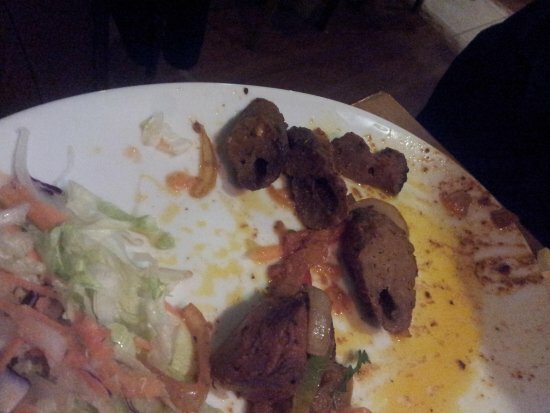 16/04/2019: Just returned from a family meal at the Raj. Once again everything was excellent. Food, staff, service and price all spot on. Definitely be back again. 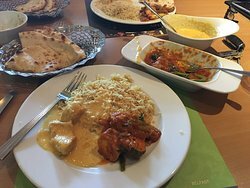 14/04/2019: Really lovely Indian restaurant which serves wide variety of vegetarian options. The vegetarian thaali dish was superbe. 08/04/2019: I have been going here for 8 years and it has been absolutely amazing. The food here is cooked straight out of the kitchen and you never ever have to wait. 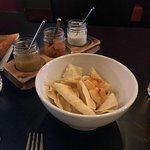 The food has flavour and amazing texture and I would definitely recommend this place. 07/04/2019: Me gustaría ir aquí para una comida con amigos ocasionalmente, el personal es muy amable, servicial y atento. Por lo general, todos pedimos algo diferente cada uno y luego intentamos un poco de todo. 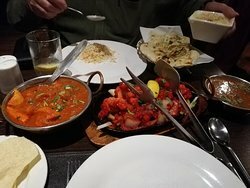 Nunca he tenido una mala comida, mis favoritos son el chili ajo pollo o pollo tikka madras. 19/03/2019: arrived without reservation on a sat. night but welcomed .A very pleasant waitress presented menus gave advice and gave us time to make up our minds.went with meal deal.excellent value and enuff choices. 10/03/2019: La comida es encantadora y llena de sabor, pero quizás he estado aquí muchas veces. Parece que solo preparan cualquier curry que quieran. Si tiene un plato favorito y desea una experiencia consistente, este NO es el lugar para usted. Si usted es el tipo de ruleta de curry, inténtelo. 28/02/2019: Beautiful food. Lovely ambience. Friendly staff. We will definitely come back again. Only downside was tgat we couldn't finish it as it was so filling. 08/03/2018: Had a great diner at Safa tonight. A great resteurant near the Ibis Hotel. Great food and very nice people who go the extra mile. They made me a mango lassi which was (as far as I could see) not on the menu. 05/12/2017: I love this restauront, I ordered the Vindaloo and it tasted amazing. 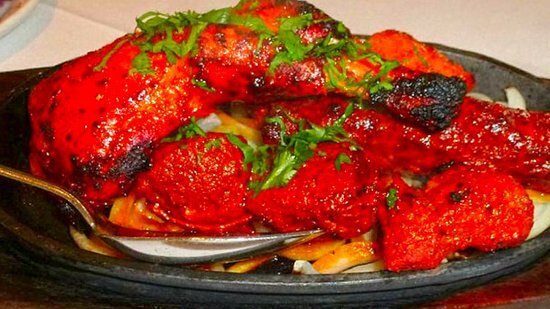 It has a really nice cosy ambiance too, I would defiantly recommend this place as I feel its the most authentic Indian I have tasted. 28/01/2019: Pity because this place use to be beautiful. Delivery was late and the food was stone cold on arrival. The korma was disgusting, watery and flavourless. The samosas were soggy and definitely not fresh. 17/05/2018: ordenó llevar esta noche y ambos arrojaron cubiertos de moho azul! mi esposa se acercó para mostrarles y ni siquiera se disculpó por una excusa de que el arroz pila se debe haber caído con el arroz hervido. ¡Sabemos qué aspecto tiene el moho azul y también el olor lo delató! 29/06/2016: Nos detuvimos para un bocado rápido ya que el sitio estaba en el camino a un evento que estaba funcionando. Corriendo un poco detrás, así que mi compañero al personal que estábamos en un poco de prisa, aunque no demasiado comprimidos, que tomaron a bordo con una gran actitud. 29/03/2015: This is one place I return to again and again. 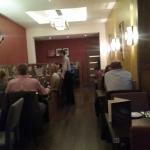 The food is always freshly cooked and the service excellent. Family run place which never disappoints.